These circumstances were first pointed out by Mr. Nichols, in a note on his “Select Collection of Poems,” vol. VI. p. 54. It had been generally said by preceding biographers, that the earl sent for him “after the breaking out of the civil wars.” But, if his lordship sent for him at all, it must have been at some earlier period; for he himself was beheaded before the civil war can properly be said to have begun. 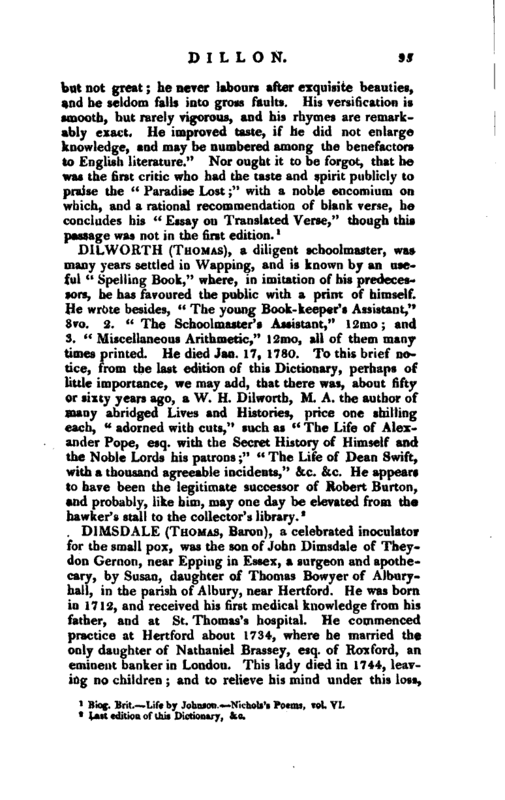 No print of lord Roscommon is known to exist; though Dr. Chetwode, in a ms life of him, says, that the print prefixed to his Poems (some edition probably about the end of the last century) was very like him; and that he very strongly resembled his noble uncle. 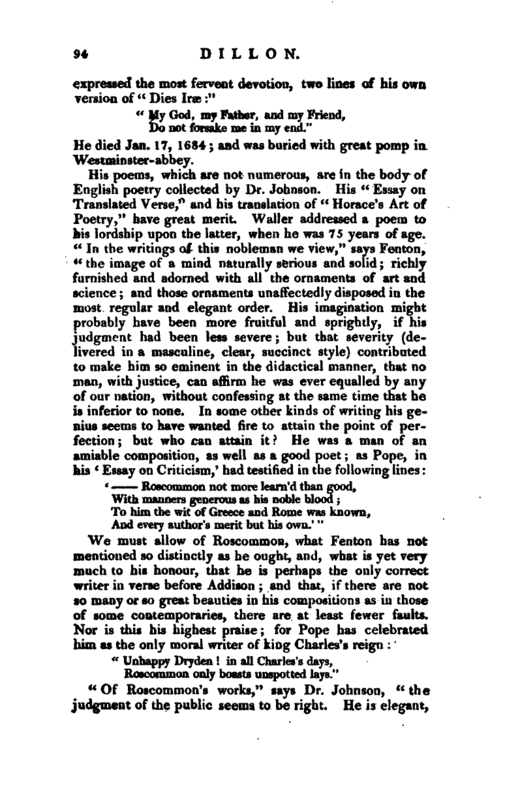 It is not generally known that all the particulars of lord Roscommon, related by Fenton, are taken from this Life by Clietwode, with which he was probably furnished hy Mr. T. Baker, who left them with many other Mss. to the library of St. John’s college, Cambridge. 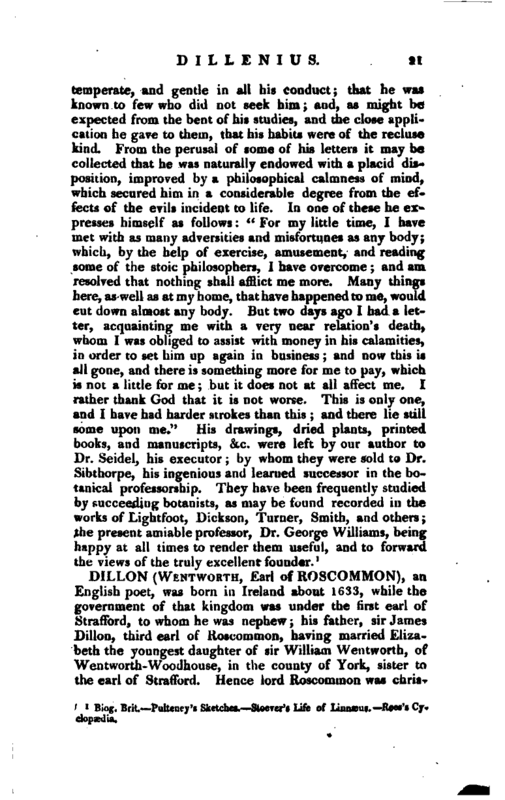 The Life of lord Roscommon is very ill-written, and full of common-place observations. He was educated in the protestant religion, his father (who died at Limerick in 1619) having been converted by archbishop Usher from the communion of the church of Rome; and passed the years of his infancy in Ireland. He was brought over to England by his uncle, on his return from the government of Ireland*, and placed at that nobleman’s seat in Yorkshire, under the tuition of Dr. Hall, erroneously* said to have been afterwards bishop of Norwich. The celebrated Hall was at this time a bishop, and far advanced in years. 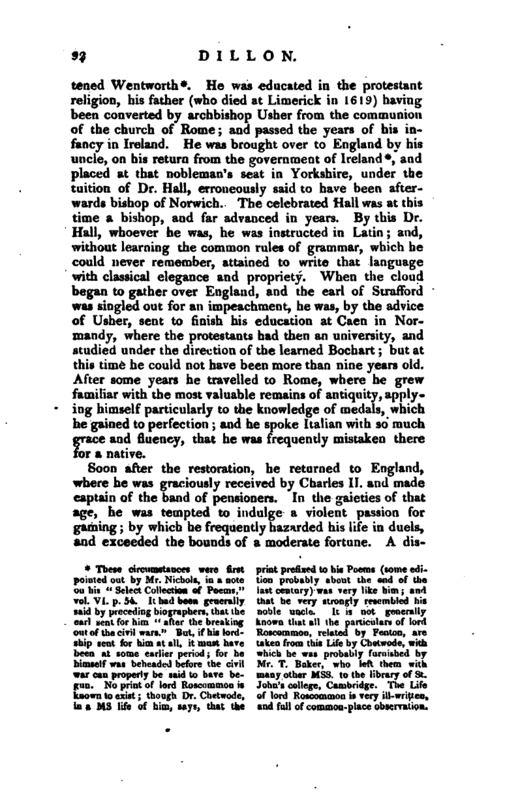 By this Dr. Hall, whoever he was, he was instructed in Latin; and, without learning the common rules of grammar, which he could never remember, attained to write that language with classical elegance and propriety. When the cloud began to gather over England, and the earl of Strafford was singled out for an impeachment, he was, by the advice of Usher, sent to finish his education at Caen in Normandy, where the protestants had then an university, and studied under the direction of the learned Bochart; but at this time he could not have been more than nine years old. After some years he travelled to Rome, where he grew familiar with the most valuable remains of antiquity, applying himself particularly to the knowledge of medals, which he gained to perfection; and he spoke Italian with so much grace and fluency, that he was frequently mistaken there for a native. Soon after the restoration, he returned to England,* where he was graciously received by Charles II. and made captain of the band of pensioners. In the gaieties of that age, he was tempted to indulge a violent passion for gaming; by which he frequently hazarded his life in duels, and exceeded the bounds of a moderate fortune. A | dispute with the lord privy seal, about part of his estate, obliging him to revisit his native country, he resigned his post in the English court; and, soon after his arrival at Dublin, the duke of Ormond appointed him to be captain of the guards. 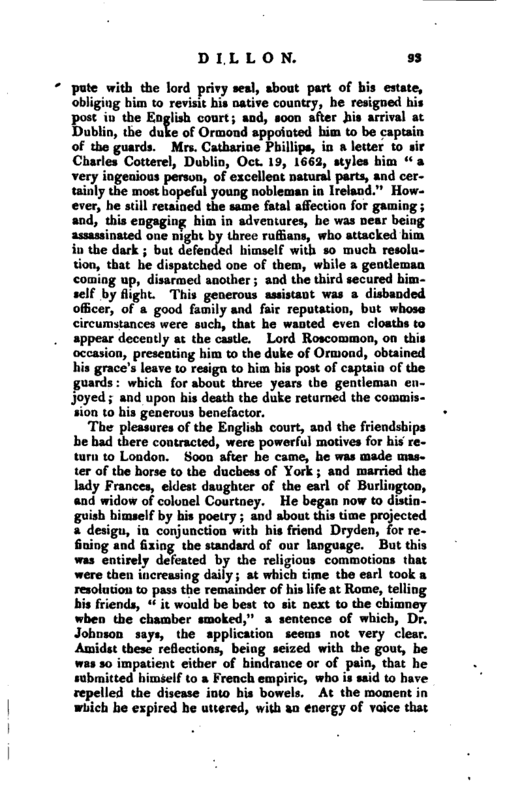 Mrs. Catharine Phillips, in a letter to sir Charles Cotterel, Dublin, Oct. 19, 1662, styles him “a very ingenious person, of excellent natural parts, and certainly the most hopeful young nobleman in Ireland.” However, he still retained the same fatal affection for gaming; and, this engaging him in adventures, he was near being assassinated one night by three ruffians, who attacked him in the dark; but defended himself with so much resolution, that he dispatched one of them, while a gentleman coming up, disarmed another; and the third secured himself by flight. This generous assistant w r as a disbanded officer, of a good family and fair reputation, but whose circumstances were such, that he wanted even cloaths to appear decently at the castle. Lord Roscommon, on this occasion, presenting him to the duke of Ormond, obtained his grace’s leave to resign to him his post of captain of the guards: which for about three years the gentleman enjoyed; and upon his death the duke returned the commission to his generous benefactor. Do not forsake me in my end." He died Jan. 17, 1684; and was buried with great pomp in Westminster-abbey. And every author’s merit but his own.’ "
Roscommon only boasts unspotted lays." Biog. Brit.—Life by Johnson.—Nichols’s Poems vol. VI.